One reason for my incomplete understanding of power engineering is that the stuff is complicated. Another is the upshot of this post: I dug far enough to conclude that more research is needed. That phrase is a dead cliche, but I mean it. We need to learn more! 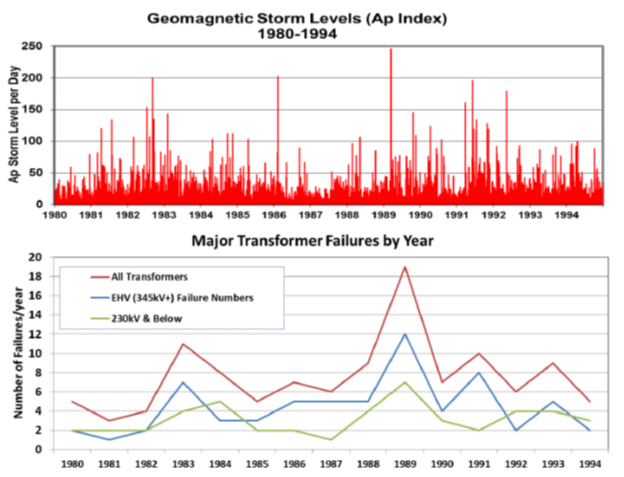 Considering the potential stakes, the effects of magnetic storms on grids are too poorly studied. Seven-figure expenditures on research might stave off 12-figure damages (as in trillions). For an employee of a philanthropy, that’s a bottom line. And the practical conclusion being reached, and my time being tight, it seemed efficient to stop there. 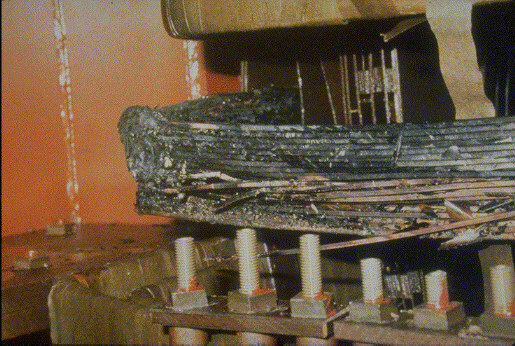 The research literature contains scattered reports of failures of high-voltage transformers, including from New Zealand, South Africa, Sweden, the UK, and the US. It turns out that many of these cases violate an image central to the doomsday scenario, of currents of once-a-century proportions spiralling into transformers and frying them within minutes. But the Salem plant’s experience is nonrepresentative in that the plant’s location put it at unusually high risk. Situated on an artificial island in the Delaware Bay, the plant complex served as an attractive electrical bridge between the regional power network to the west and the conductive Atlantic Ocean to the east. And the igneous ground beneath the plant is electrically resistive, so it could not absorb much of the intense electrical pressure. So, on the one hand, the Salem plant transformers look to have been more vulnerable than most. On the other hand, their story illustrates the danger of ignoring geomagnetic storms when designing power systems. The South Africa experience makes me wonder: perhaps the common focus on extremes (including in my own work) is partly misguided. Perhaps the greatest risk is posed by once-a-decade rather than once-a-century storms, or by lower-latitude exposure to those most extreme storms. Girgis and Vedante contend that geomagnetically induced currents would do no disabling harm to the “great majority” of transformers. Why? Storms affect transformers in two main ways. The first is distortion in the currents going in and out. Normal currents are composed of smooth AC waves oscillating at 50 or 60 times per second. In a storm, the waveforms might gain noise, or wobble in frequency. The energy involved might not be overwhelming, but any such distortions can disrupt a finely tuned power system. Second, at particularly energetic moments, the storms can generate large current spikes that saturate the transformer’s magnetic core and cause overheating. The second effect, argue the ABB engineers, takes places over minutes, perhaps even hours, while the first is nearly instantaneous—and should trip protective equipment that will disconnect the transformer before the second does serious harm. If a large storm “trips” many transformers, a blackout may ensue. But in that fragility lies resilience: after the storm passes, the grid can be switched back on. 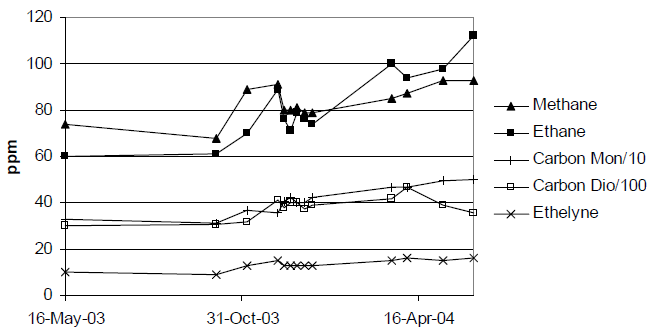 Second, another way to reconcile the evidence at hand may be to factor in aging. The transformers simulated in models are ideals. The brand-new transformers put to field tests approximate the ideals as well as can be achieved. Perhaps as transformers wear out they become more vulnerable to storms. If a major storm administers the coup de grâce to many at once, one might argue that the storm is not the primary cause of their demise. But that would give little solace to people freezing in the dark. Or, in a subtle variation on this idea, perhaps old transformers are vulnerable by virtue of design rather than aging, as Girgis and Vedante suggested for some cases. Then the question becomes whether the field tests are representative of the current fleet of transformers in operation.